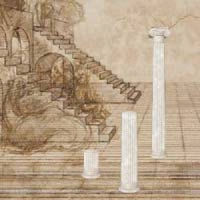 Move around the columns in this preparatory drawing for Leonardo’s Adoration of the Magi and explore how perspective works. In Leonardo’s time light was thought to travel from the edges of objects to the eye, forming what is essentially a cone with the eye at the tip and the object at the broader base. With this in mind, artists such as Leonardo used a system, now known as linear perspective, to reproduce this effect in the hope of creating a sense of depth in their work. The system relies on the use of something called the vanishing point. This is the point in the picture where apparently parallel (though usually imaginary) lines seem to meet up. The number of vanishing points in a picture indicates just what type of perspective technique is being used. Linear perspective relies on there being between one and three vanishing points in a picture. Far more complex perspective techniques can also be used, although these do tend to melt the brain. Linear perspective is thought to have been invented by an architect from Florence called Brunelleschi, whose ideas were embraced and developed by the Renaissance artists. The first published account of these ideas was in On Painting, by Alberti, which was first published in 1436 but which can still be found today.